Sighting caused astonishment in the town of Pucyura in Vilcabamba. 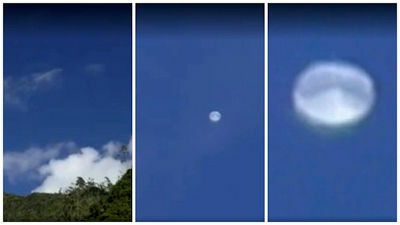 This morning an Unidentified Flying Object was sighted by villagers in the town of Pucyura in Vilcabamba (Cusco), reporter Raul Puma managed to videotape it and states that it is something never before seen in the area. "I got it on film at about 07:30 hours, but the object was flying over the area Habaspata very early, sometimes it approached and moved away from where we were not emitting any kind of sound and from one moment to another disappearing the clouds, " he stated.